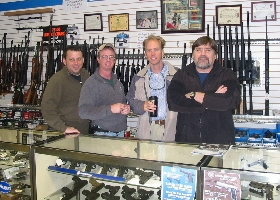 Our highly experienced staff can tune and accessorize your gun to meet your needs. We can also build custom rifles and offer custom barrel threading for mounting sound and flash suppressors. We transfer FFL firearms. We can ship a firearm to another dealer or receive a firearm from another FFL. Small fee applies. Shooters Supply is known for its exceptional customer service. Shooters Supply offers custom gunsmithing.